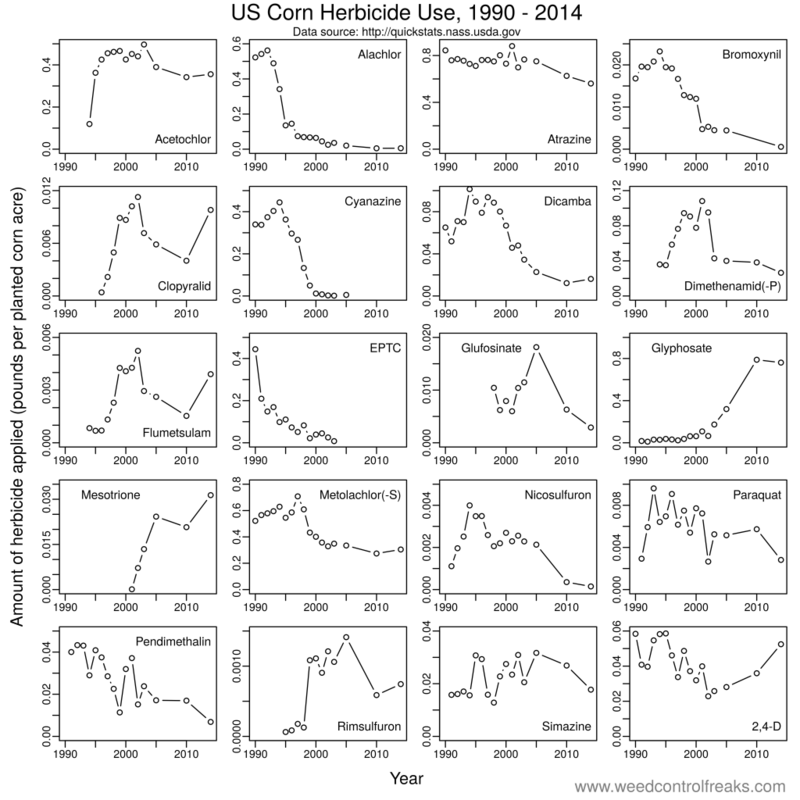 USDA-NASS recently published the most recent corn herbicide use data (from 2014). I’ve been looking through the data, because, well, free data! Perhaps the figure below isn’t the ideal way to present it, but there are some interesting trends that can be observed this way. Total herbicide use in corn (in weight of herbicide applied) has remained relatively constant at about 2 to 2.5 lbs/acre since around 2000 (Top panel A). There have certainly been changes in which herbicides contributed to that total, though. Alachlor and cyanazine use has stopped due to health and environmental concerns. Butylate and bromoxynil declined; an argument could certainly be made that this was due to farmers switching to glyphosate in Roundup Ready crops. Metolachlor and dimethenamid also declined in weight applied, but this seems mostly due to newer formulations with lower use rates (S-metolachlor and dimethenamid-P). Simply looking at the weight of herbicide applied doesn’t tell the whole story. Panel B in the figure above shows herbicide application data in terms of the proportion of acres treated with each herbicide. For example, in 2014, atrazine was applied to 55% of corn acres, so the light blue area in 2014 has a height of 0.55. The y-axis exceeds 1.0 (or 100%) because on average, each corn acre received more than one herbicide. If you look at the data this way, it appears there’s been a steady increase in the number of herbicide applications (or the number of herbicides applied in a single application) for each acre of corn. Bromoxynil, dicamba, dimethenamid, and nicosulfuron all seem to have decreased as glyphosate use increased. These herbicides, therefore, would be candidates for herbicides that glyphosate “replaced” in US corn production. 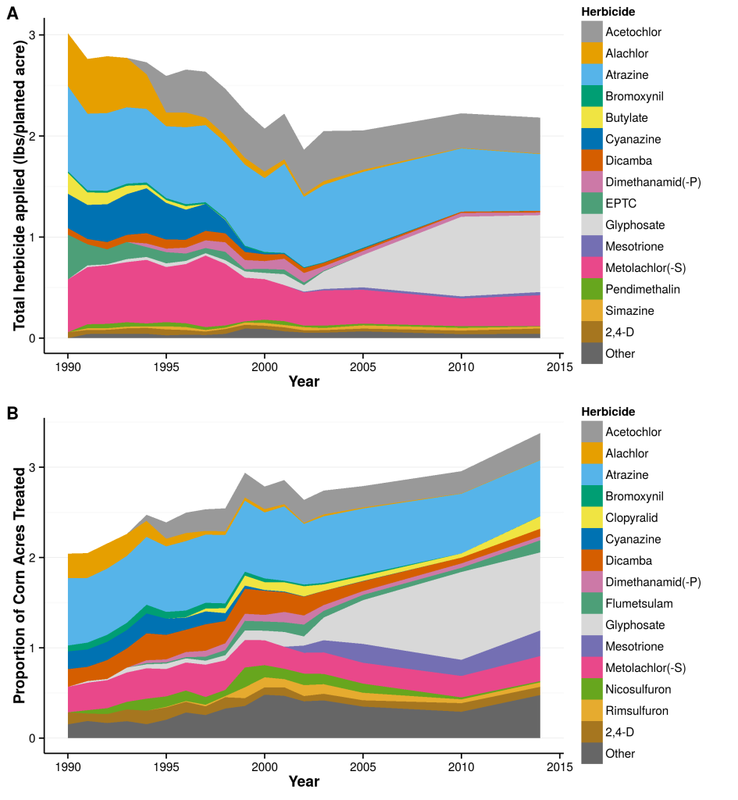 But, even this wouldn’t tell the whole story, as other herbicides like mesotrione and isoxaflutole (in the “other” category) also increased during the same time period. Below is a more traditional line chart for 20 different herbicides that make up most of the corn herbicide use in the NASS data. There are a total of 56 different herbicide active ingredients, once you combine the various forms of glyphosate, 2,4-D, metolachlor, etc. Previous Article What does Chipotle’s switch to non-GMO ingredients mean for pesticide use?